As i did in 1979, i again have come to realize “Murphy’s Law” desk calendar’s daily entry is a lot more than funny. Its a pretty deep (oh okay: it’s deep for me) in the realm of human nature. Hanlon’s Razor — Never attribute to malice that which is adequately explained by stupidity. Looking back on my last several posts, it seems i have become hooked on Mr. Murphy and his laws. i promise (weakly) i will back off. Mr. Murphy might sue me for copyright infringement. i often get damn near ill when people start talking or writing about generalities when it comes to people. It seems we keep classifying people by their race, the color of their skin, their religion, their politics, their sexual preferences and completely ignore they are individual human beings. i guess it’s easier that way. Then last night on PBS, which many of my conservative friends will determine this post is no longer worth continuing, ran a segment that blew me away. The story is about a Syrian immigrant to the United States who is also a Muslim. My thought was until all of the critics of their perceived enemies with their perceived generalizations about those enemies, foreign and domestic, right or left, black, white, brown, yellow, and green (okay, okay, i sort of went a little overboard on green), and on, and on, and on, can approach doing what this amazing gentleman is doing, they should reconsider their generalizations. i was thinking this would be a quiet, lovely weekend. This is critical since one entire wall of my home office is a bookcase completely full of books. i once promised myself i would read all of the Harvard Classics and the Franklin Library collections that i haven’t read and then reread many others placed there because they are special to me. i figured when i retired (sic) each time (right now, the number of retirements stands at about a dozen), i would devote several hours a day to this task. Ain’t happening. Today, it turns out, is no different from the other days when i laid aside time to read leisurely (such a nice comfortable term that “leisurely”). We are in the process of needed maintenance on our courtyard, So there are some palm varieties that had to leave the scene. They have and the final stump removal occurred today. That means, of course, that someone must find the drains in the planting areas, make sure they are extant, clean the surrounding area and put river rock atop them. You see, the rains again are coming to the Southwest corner in a day or so, and the planting areas will not be replanted by then. So, a rain will wash the dirt and debris down the drain; it will plug; and then we’ve got a bigger problem. So that has to be done NOW. In an effort to do everything at once, in spite of our “a little bit at a time” plans, we also began making the front room worthy of Maureen’s art and craft show (as well as it being her office). So reflooring commenced in the middle of the week. To re-floor, we had to remove the shelves my father had installed in the closet some ten years ago. i got that removal job. Painting the closet became the priority. That painting began today and will conclude one day next week. Now, some smuck gets nailed to prep and paint the door frames and the quarter round for the baseboard. Guess who? In checking out the stump removal, Maureen pointed out the master bath’s exterior door needed to be prepped and repainted. i cried, but admitted that was my job long forgotten (purposely because i do not like to paint and dislike prepping for painting even more). Oh, and did i mention income taxes? Organizing my office? Getting the stereo to work properly? Fixing the light fixture and the light switch? So the reading in the sunny morning has already taken a hit. i had already given up going to watch the Tony Gwynn Classic at San Diego State and University of San Diego fields with this year’s teams consisting of UC Irvine’s Anteaters (man, i love that nickname), Notre Dame, Oregon, Seton Hall, the two host teams, and Tennessee. I have also conceded the afternoon to not watching Vanderbilt play Mississippi State in basketball on the tube. Of course, i taped that and will watch it later…if i get all my work done. i told Maureen this was my new motto, seriously thinking i might yet salvage some basketball watching and reading in the sun for the afternoon. i am now planning a marathon night of reading to catch up. i wonder if in my torpor of old age, i can still do that? Arthur Schopenhauer was a German philosopher, born in Poland, February 22, 1788 (from Wednesday’s “Writer’s Almanac,” the source for much of the information on him in this post). 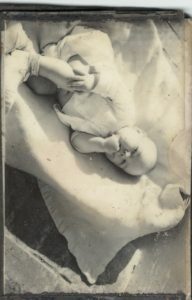 Had he been born today in the United States, he would be excruciated into oblivion. You see he believed “women were foolish and meant to obey.” i cannot imagine any man of even questionable intelligence at any time in history admitting he believed either. But his other ideas have some merit from my perspective. He had this idea of two realities: one we have from our “limited senses and reasoning,” and “the other of universe as it truly is.” This idea, which i think is on target, would also get him pilloried and burned in effigy today, along with mass protests. It seems we should all consider where our reality lies in relationship to the universe as it really is. But that ain’t gonna happen here and now. Too many folks are going for the jugular with no attempt to consider what the reality of the universe might truly be, let alone the reality of the other side. So i’ve written enough to join Mr. Schopenhauer in the pillory. All sides will leap to my perceived offense against them with no regard for intent. That’s okay. i’ve gotten used to it, and such reaction makes me consider their thoughts, even changing my take on reality, which is just as not accurate as anyone’s compared to universal reality. So even though it hurts, it is a good thing for me. In the reality of Mr. Murphy — you know: the guy who came up with “Murphy’s Law” except it wasn’t really Mr. Murphy; it was another guy with the same name — Schopenhauer was credited with one of the laws in “Murphy’s Law Desk Calendar,” damn close to being a second bible for me. To revisit, my Uncle Pipey and Aunt Evelyn Orr sent me my first desk calendar of Murphy’s while i was spending 1979 Christmas in Hong Kong as a staff member of the Commander, Amphibious Squadron Five staff. The calendar was my Christmas gift from them for about thirty years after that. I looked forward to opening that present every Christmas and now buy it for a Christmas present to me from Santa Claus. If you put a spoonful of wine in a barrel of sewage, you get sewage. If you put a spoonful of sewage in a barrel of wine, you get sewage. i must admit, even in the universe’s reality, there is a whole lot of sewage and not very much wine flowing around this world. But something is bothering me in my reality. It has been several years since Mr. Murphy, yeh that one, included “The Law of Thermodynamics” in his desk calendar. Perhaps this was just an oversight on Mr. Murphy’s part or mine. i fear someone somewhere in the political spectrum expressed outrage at such a concept, and that particular law was barred due to it upsetting someone whose reality is whatever hits the fan is actually evenly distributed. Of course, that it is a bit of reach for anyone’s reality, but i’ve seen further stretches of reality. And whenever i consider the reality of that law, i know everything in my universe is sometimes grounded in reality, and i can deal with it, and smile. Electoral College or Popular Vote? For those who wish the Electoral College was eliminated and the popular vote was the deciding factor in elections, i was once of that opinion. However if the popular vote was used to determine presidential election outcomes, the most populous states, California, New York, and Florida voters would hold sway over the rest of the country. i’m damn sure i would not like that. There is another reason from history: Abraham Lincoln (whose birthday is today) only garnered 40% of the popular votes for president in 1862. For those of you who don’t know, i have almost given up on movies. i will go anytime, anywhere to anything with my grandson. But those opportunities are rare. i will go to any movie either of my daughters would like me to accompany them. Fortunately, Maureen has given up on me going to movies with her and she is satisfied, probably even happier going to to movies (she’s a movie buff) with friends or alone. But stage productions, that’s a different story. i blame Sarah. When Sarah was majoring in drama at San Diego State, i went to all sorts of productions. It was supposedly a support thing. But in truth, i enjoyed all of them, even those without Sarah in the production. i have been to several since she graduated and moved to Austin. 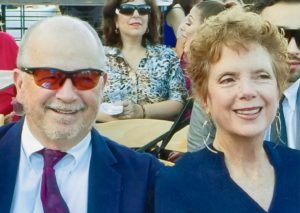 i have promoted Maureen and i going to those at SDSU and elsewhere. Tonight, it was like some kind of fusion, some extraterrestrial voodoo. Maureen had caught the promos for this play in the newspaper a couple of months ago. She got us tickets. The title of the play was “Picasso at the Lapin Agile.” It was at the Old Globe. No, no, not that “Old Globe” in England, but the replica built in 1935 in Balboa Park. The big differences are the audience has seats where those folks watching back in that other one stood, and this one is fire proof, even air conditioned. So we have a representation of the heart of the beginning of great drama, aka Shakespeare and the Old Globe to start. Then the play’s author is Steve Martin (the reason Maureen was enthralled enough to get the tickets). i was skeptical, even though i’m a theater fan. One of the actors, although not the star but nevertheless a headliner was Hal Linden. Now, i haven’t had too many brushes with fame. But one was when Sarah was around three and we were at the PGA West clubhouse for lunch, hosted by our Sarah’s godparents, Frank and Jan Kerrigan. Hal Linden walks through after finishing his round. He spots Sarah, comes over to the table and after introductions, picks up Sarah, tosses her into the air, and hugs her for several minutes. i must say here that Sarah’s sister Blythe may have the edge here. When Blythe was three, we were waiting at a gate in LAX for someone to arrive. Bing and Kathryn Crosby came off the flight in the first group. Kathryn saw a beautiful young child, came over, asked our permission and picked her up. They laughed and Kathryn showed Blythe to Bing commenting on how beautiful she was. Then several months later, we were at the baggage claim at LAX. Blythe dashed away from us and grabbed onto the leg of a gentleman waiting for his luggage. It was Rod Serling, the guy who brought us “The Twilight Zone.” He picked Blythe up, laughed, gave her a hug and then gave her back to us. But Hal has been one of my favorites even if he hadn’t had his moment with Sarah. Now mind you, Hal wasn’t the premier actor in this show. But he was great as “Gaston,” the old sardonic Frenchman…and boy, did he play that clarinet at the end. The play was interesting in that Steve Martin envisioned Picasso and Einstein meeting, which they never did, and analyzed their genius and proclivity for women with wit, irony, and a touch of deep thought. So it was a beautiful night, a play doing things a play should do for someone like me in a beautiful setting with a beautiful date. We walked back to our car, parked by the Natural History Museum under the colonnade of buildings along El Prado, built for the Panama Exposition in 1915. Discussing our options, we decided on a nightcap nearer home. So we stopped at Romesco’s, a “Mediterranean” bistro with a tapas bar in the back. There, we had a desert with a Tempranillo (Maureen) and a Manhattan on the rocks (me). That stop is the reason this is being posted tonight rather than last night. It was, as i imagined, a night for folks to enjoy while growing old…together. i kept thinking, “i hope my friends can have nights like this. It is three-by-four inches, black leather bound. 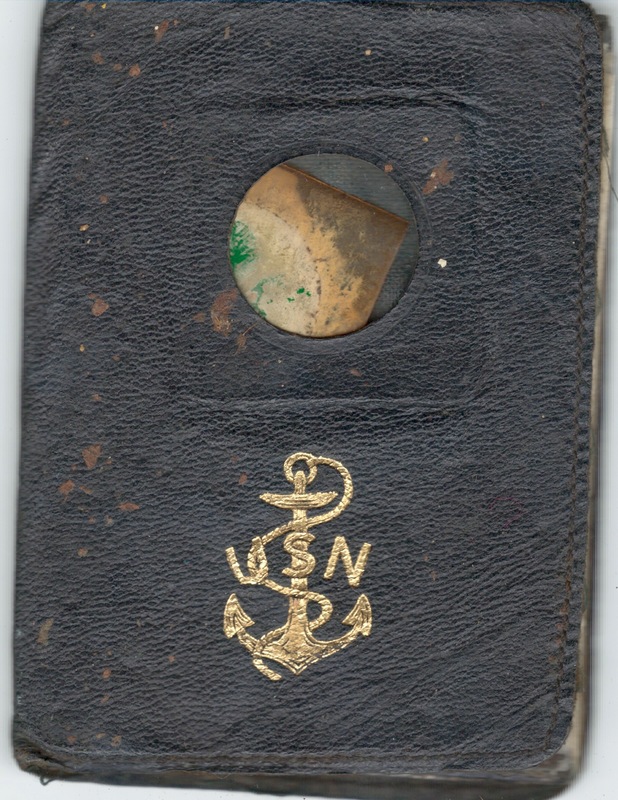 The traditional fouled anchor was more than just a chief’s emblem in 1944 because it is in gold seal on the front of this packet carried by a machinist mate, automotive, second class petty officer in the 75th Construction Battalion. i am not sure how Jimmy Jewell first obtained it, but he carried it for over two years while in the Southwestern Pacific during World War II. i guess he either bought it at the PX in Gulfport, Mississippi while literally waiting for his ship to come in, or his wife, Estelle, sent it to him with all of the photos already in their enclosed jackets. It was in that baby blue and faded pink “Deluxe Baby Gift Box” that once contained “Baby Powder • Baby Cream • Baby Soap • Baby Oil” by “Johnson & Johnson” with locations in “New Brunswick, N.J.” and “Chicago, Ill.” i’m guessing someone gave the gift box to my mother for tending to me while he was gone, and when he returned home in December 1945, he noticed the six-and-a-half by nine by two-and-three-quarter inches empty box was just the right size to store photos and memorabilia from the war, many of which shouldn’t be shown to polite folks. i don’t know where he kept it, but in 2003, he gave it to me. i’m sure he had forgotten about it, and ran across it when he was moving with his wife to a smaller home after living in their home for sixty-two years. i think i just happened to be there when he found it and didn’t know what to do with it. So he gave it to me. There are many treasures there and many still should not be shown to polite folks. But this one is special. 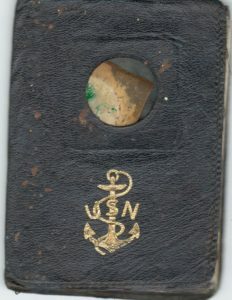 The cover’s pocket above the insignia has some kind of transparent protection. According to the explanatory note inside, the pocket holds a four-leaf clover, the work of the Panama Canal Zone “Wire Chief.” The process for preserving the clover is explained, but after seventy-three years, it has lost most of its green and slid catty-wampus in its pocket. Apparently, it did as promised with the blessing of “Good Luck, Good Health, Good Fortune” and brought one Jimmy Jewell through New Caldonea, Guadalcanal, Bouganville, Banika, New Guinea, and Leyte with the enemy always coming close but not too close. 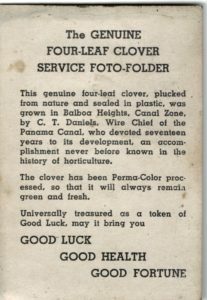 Through it all, he carried this little leather packet of nine photos and the card explaining the four-leaf clover. 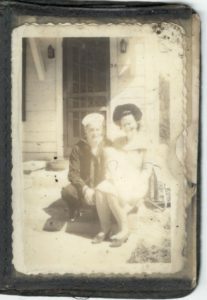 i imagine it in that small left breast pocket on the dress and undress blues, but i don’t think they wore them very often, if at all, once the liberty ships landed in Espiritu Santo, the New Hebrides island where the indoctrination to Southeast Asia began. All of the photos have faded. i suspect most of the degradation came from the tropics in that corner of the world. It is not a kind place for any kind of equipment or treasure. The first photo always stirs some deep emotion with me. i have doctored it a bit here. It’s the little bungalow they rented in Gulfport in May. i surmise they must have rented two. 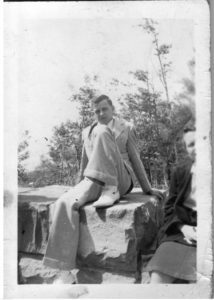 Aunt Naomi, his older sister, was a major contributor for the drive in her car with the new tires, rare because of the rations, Bob Padgett loaned her for the trip. Friends and family threw in their ration cards for gas to ensure they could make the round trip journey. Somewhere in these piles of memories, i recently found a photo of my grandmother with me suggesting she was on the trip as well. So i’m thinking the other two women shared a room. i keep thinking they were women who did not play by the rules of then. The second and third photo in the packet shows where his heart truly lay. The first is the two of them next to his parent’s home on West Spring Street. 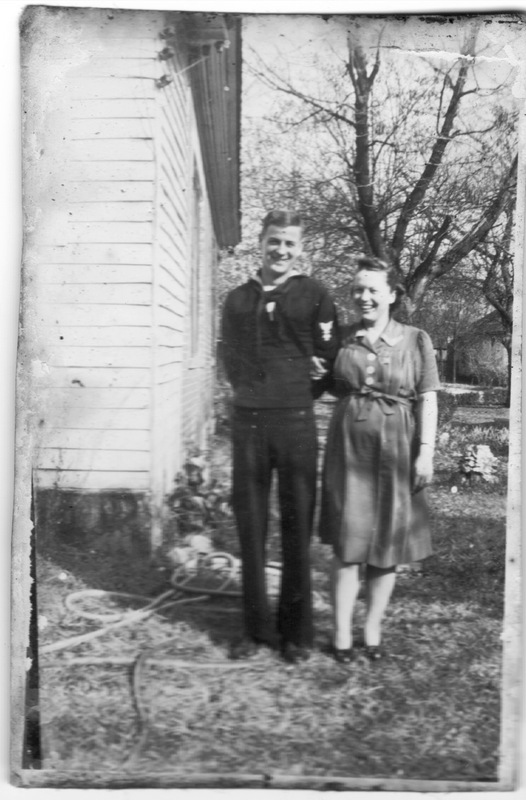 By the swell of her abdomen, i’m thinking it was his first return in late September/early October when he had finished boot camp at Parris Island and was on a round about trip to Davisville in Rhode Island. And then, the second photo of the couple about two months later. November perhaps. 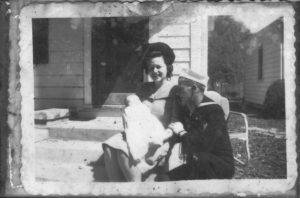 He had completed his training and was headed to Gulfport to await for the inevitable call to board a ship and head out to places he could barely imagine. After all, his life experience had been in Middle Tennessee with trips to Gatlinburg and Florida. That was about it. But crossing oceans were about to provide him a look into a world he could not imagine. Estelle looked marvelous for someone into her sixth month of pregnancy. She loved him with no reservations. When she was fifteen down on South Cumberland Street , she was visiting her mother, , who held a 24/7 job — They didn’t call it that back then. They might have said, “Mrs. 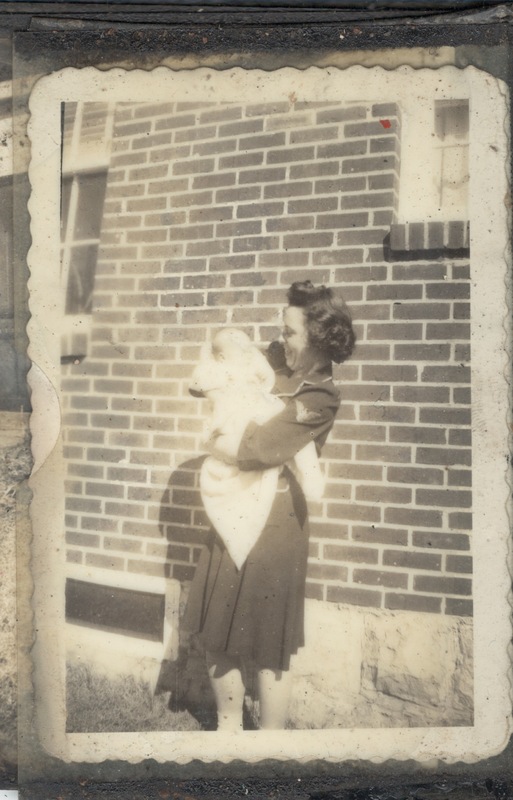 Prichard works around the clock nursing people to provide for her children since their daddy passed away two years ago.” — The visit coincided with the young man in his bib jeans walking home to West Spring Street from the high school where he helped his father in the janitorial tasks. 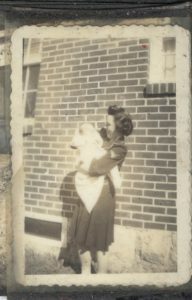 She pulled her mother out on the front porch as he passed by. 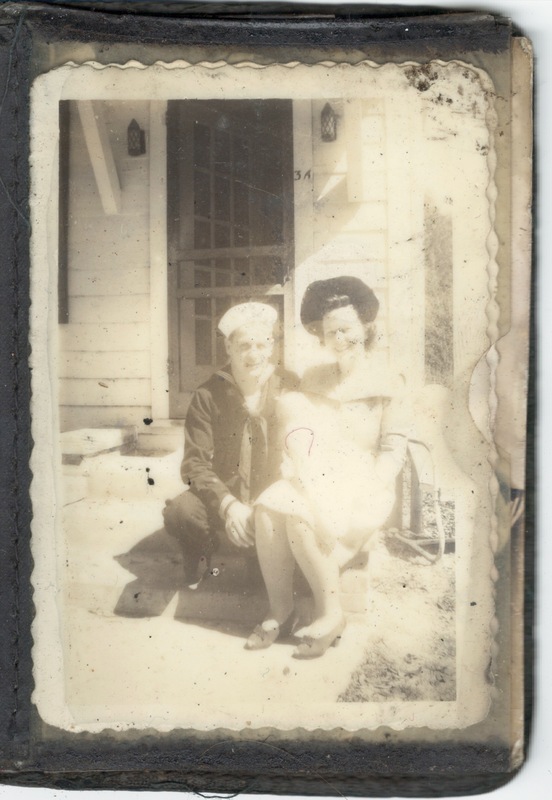 She wanted her mother to see the man she loved. He had other women in his life. His stately and elegant older sister Naomi lived at home and worked as an operator at the phone company office over on Gay Street, walking there every day. i wish i had asked if she worked seven days a week. i suspect she did, and i know the pay was paltry. He dropped out of high school before his senior year to work at a motor car company beginning with washing vehicles and changing tires. Between his $13.00 a week salary and Naomi’s, they kept the family above water. Culley Jewell had contracted tuberculosis in 1934 and could not work until he passed away in 1939. 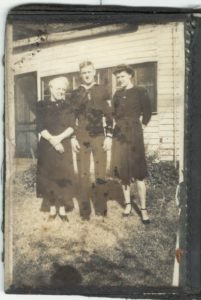 So Mama Jewell, Naomi, Jimmy and the youngest brother Huffman lived in the family home. The fourth photo was another shot from the Gulfport trip. i was pretty small, but they obviously were proud of me then. They knew then Jimmy would be leaving soon, getting on that liberty ship. They did not know his ship ( i regret he never told me her name) would head through the Panama Canal up to San Francisco where they would embark the last of the 900 troops on a ship designed to hold 550, and then sail west for a month to Espiritu Santo, one of the southernmost islands in the New Hebrides chain — it was the jumping off place for allied troops into the war and the fictionalized location of “South Pacific,” the musical developed from James Michener’s Tales of the South Pacific. 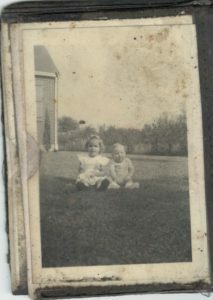 Next is a photo of my aunt holding me back in Lebanon. 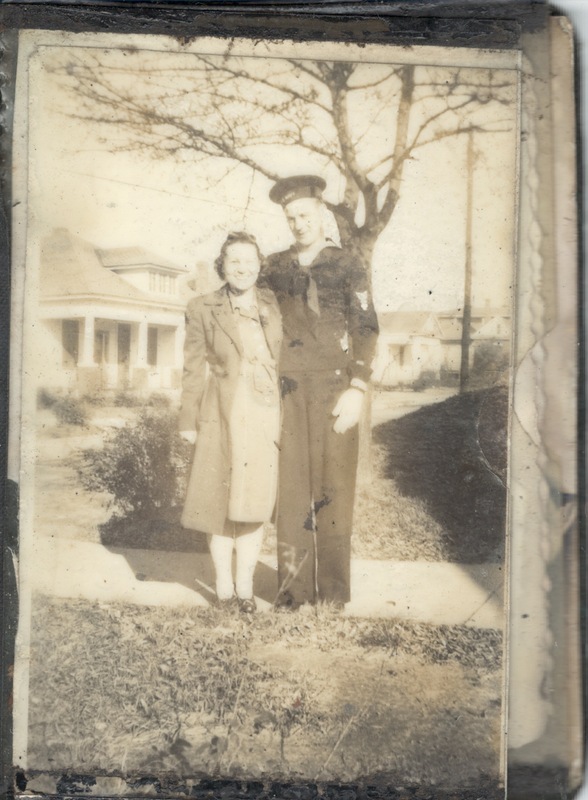 Bettye Kate, Estelle’s youngest sister, and her husband, Alvin “Snooks” Hall, were very close. 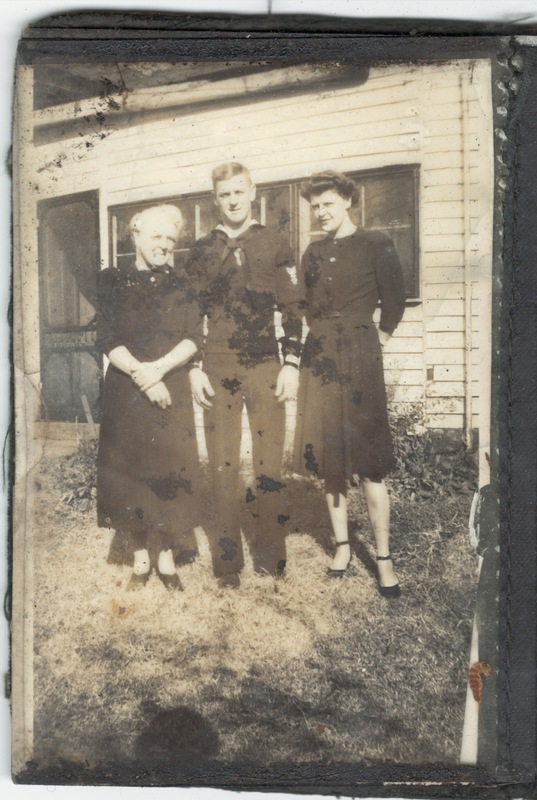 When Jimmy, James “Pipey” Orr, and Bill Prichard went to war, Snooks, deferred because he was a farmer in Shop Springs, became the male support for the women of the Prichard clan. In the mid-1950’s, he partnered with Jimmy for “Jewell and Hall,” a vehicle maintenance shop and a gas station (Mobile petroleum products featuring a sign in front with a rearing Pegasus). The two were best friends, almost as much brothers as the sisters. When several of Jimmy’s long time fishing partners passed away, he talked Snooks into fishing. They did almost everything together along with their wives. 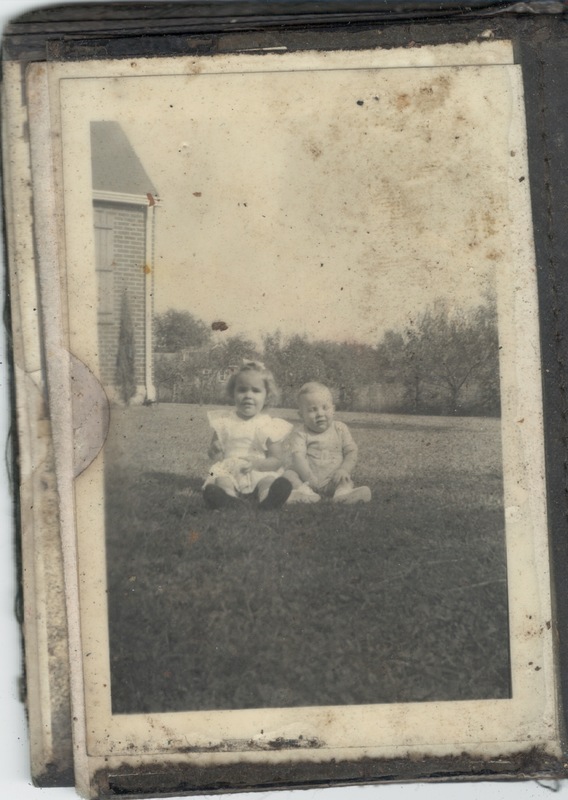 Aunt Bettye Kate was my second mother. Then there is a photo of just me, i’m guessing four months. Today, i look at it and am amazed how i’ve returned to my origin: chubby body, fat cheeks, bald head. It is upside down in the packet. i try to imagine him in the jungles of New Guinea (i’ve been there and can attest there are jungles, plenty of them, dark with vegetation) where at night, the tree rats would crawl across the sleeping seabees in their tents. i think after he got out his flashlight to scare away a rat, he would reach into his clothing and pull out the packet, turning it to this photo, turning it to the side to look at his son. i hope, lord i hope, it made him smile, gave him some hope, made him think about that little place across an ocean and a continent he called home. Yes, i hope i helped him just a bit. The last enclosed photo in the packet reveals the Prichard family closeness. When the men became husbands and the woman became wife of the Prichard’s, they immediately and forever became family. He was. And his love for family shows in this one. Nancy and Johnny Orr in the side yard of his home, the first of the next generation of the Prichard clan. He held them dear, treating them as his own, and they in return, calling him “Uncle Jimmy” and the other “Uncle Snooks” but knowing they were more like fathers in the queue more than just uncles. As i wrote this, i kept feeling i had published a great deal of the information before. But it just seemed like it needed to go here. It fit. It was Jimmy Jewell in the war with his special packet of photo memories in a special “four-leaf clover” packet. i also thought i am not sure he would like this. He could be sentimental when it came to his wife, his children, his family. i have seen that. But he was not sentimental about himself. He talked very little about himself. It was only when i was past middle age when he said anything about the war. Then, it was mostly sharing war stories. He never talked about how he felt. He, along with damn near every man who left his home, put on a uniform, and headed into the unknown war theaters, would say it was just something they had to do. They did have to do it. And boy, did they carry through. i hope all of them had a packet with a four-leaf clover and photos to get them through the rough times of getting the job done. Every once in a while i pull up a poem i wrote a number of years ago. It sort of puts me in my place and then revives a passion i think i have always had and always will have. i do not know why. i’m not particularly good at writing. My grammar is often shaky. i often break the rules. My editing is terrible. I sometimes get “smarmy” as Sharry Baird Hager once desribed my writing. And i can get on a roll and go over the top, writing what i really didn’t mean to write. Then i run across this poem again and realize i ain’t gonna quit. i don’t know why. it’s time to put aside such distractions. I will succumb and dream again.